CAPE CANAVERAL, Florida -- The Space Coast Music Festival will be held at Manatee Sanctuary Park located at at 701 Thurm Boulevard in Cape Canaveral, Florida on Saturday, September 28th starting at 11:00am. Admission is $5 to enjoy 10 hours of non-stop music on two stages from noon to 10 p.m. Children under 12 are admitted free with a paid adult admission. 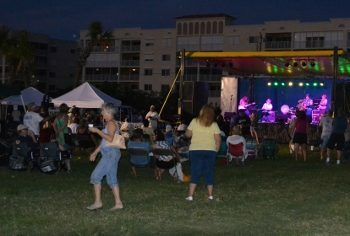 Two stages of continuous music will feature THE NEW ORLEANS SUSPECTS, local Space Coast group ROCKET RANCH, southern rock band DIABLO CANYON, classic rock band Deluxe Mojo, and many more. The music fest will also feature an Eco Awareness Village celebrating National Public Lands Day, a classic car show cruise in, and a children's stage and activities area with Rock Star Parties, where children get their face painted, colored hair spray and perform with real instruments. Bounce house, rock wall, jousting, kayaking along with many other fun activities for the kids. To kick off the fest, the Cape View Elementary Drum tribe will show their talents on the new drums they have received over the past couple of years. The show will be held rain or shine. No coolers, outside food or drinks, and no pets Come enjoy a fun filled day of great music, silent auctions, raffles, kids activities & fun! Bring your lawn chairs or blankets and spend a musical day to help buy instruments for the kids at Mila Elementary School in Merritt Island, Florida.